Membership runs from January to December, with the two newsletters issued in late Spring and Autumn. Renewal forms are sent out with the Autumn newsletters, however you can join or renew at any time of the year. You will receive the 2 newsletters for late Spring and Autumn either immediately or as soon as they are produced, depending on when you complete the membership application. To join or renew please select one of the options below. We use PayPal to process online payments, and your address and contact details will be passed through to us. If you are renewing, it would be very helpful if you could note your membership number in the appropriate box when ordering (the number can be found on the renewal form sent to you). 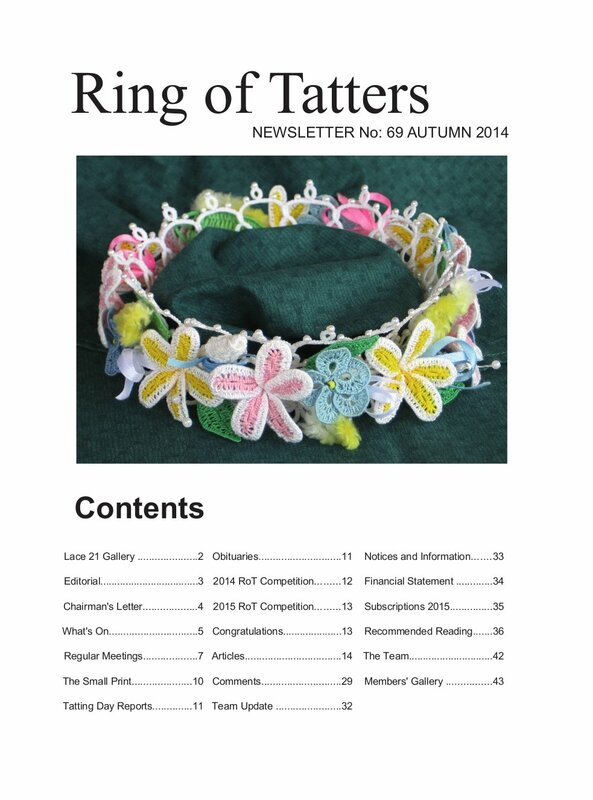 Members wishing to receive copies of earlier newsletters may do so while stocks last. Please contact distribution@ringoftatters.org.uk for details. We print a Register of Members with contact details of members who have opted to have their details included. The Register is available as an optional extra. It can be very useful if you want to find someone nearby to help you with tatting, or form a group, or meet a tatter when travelling either locally or globally. If you want your details to go into the Register of Members, you need to join or renew by 28th February . The badge (pin in the USA) is dark blue enamel with silvered edge and silvered tatted motif. It is 25mm (1 inch) wide by 12mm (0.5 inch) deep. This can be ordered at the same time as your membership renewal (please select the appropriate option below). Annual membership includes two 44 page newsletters posted around April & October each year. 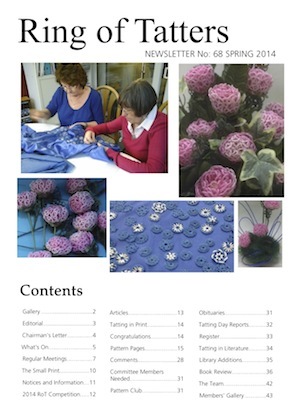 The newsletters include: patterns, upcoming tatting days & other events, a list of groups who meet regularly, reports and articles, an annual tatting competition, and more. UK members have access to a lending library. If renewing, please enter your membership number in the space provided (this can be found on the renewal form sent with the Autumn newsletter). If you would like a printed copy of the current Membership Register or a Ring of Tatters badge/pin, please select the appropriate option below. The badge (pin in the USA) is dark blue enamel with silvered edge and silvered tatted motif. It is 25mm (1 inch) wide by 12mm (0.5 inch) deep. Please make sure you select the correct area of the world - incorrect payments requiring refunds cost us! Thank you. NOTE: This item is for last year and will result in both issues for 2018 (No. 76 & 77) being posted together to the member.